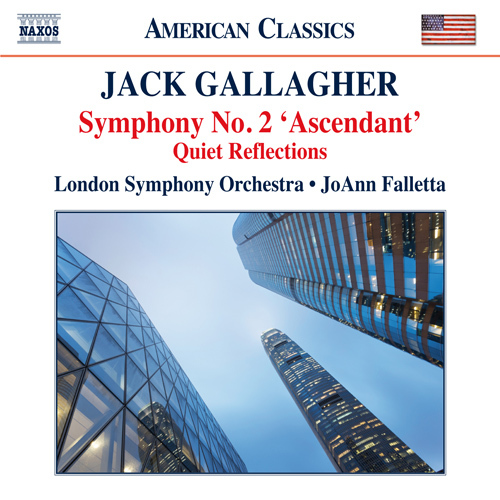 Jack Gallagher continues his association with the London Symphony Orchestra conducted by JoAnn Falletta with Symphony No. 2 ‘Ascendant,’ a robust, colorful work of dramatic contrasts and expansive architecture that seeks to express the aspirations and strivings of the human spirit. Quiet Reflections is a calm, serenely lyrical meditation which evokes a sense of longing for past tranquility. Gallagher’s previous Naxos release Orchestral Music (8.559652) with the LSO conducted by JoAnn Falletta was awarded five stars by BBC Music Magazine and hailed as "fresh and exuberant" and for "its explosions of sound and colour" by Gramophone.